Electric Salt And Pepper Grinder Just $10.40! Down From $40! You are here: Home / Great Deals / Amazon Deals / Electric Salt And Pepper Grinder Just $10.40! Down From $40! Don’t miss this deal from Amazon! Get this Avvio Electric Salt And Pepper Grinder for just $10.40, when you apply the extra 5% discount coupon located below the price, down from $39.99, PLUS FREE shipping with Amazon Prime for orders $25 or more! 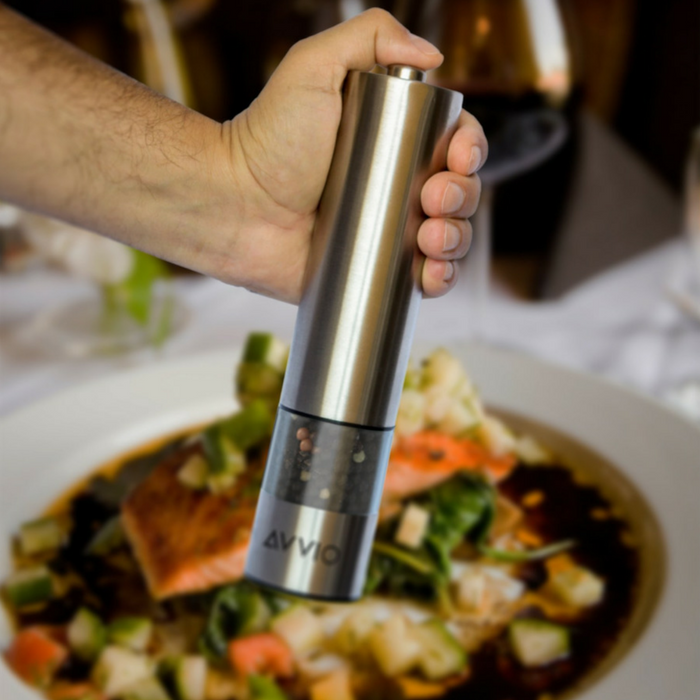 The Avvio Electric Salt And Pepper Grinder is a simple and convenient kitchen tool. Battery operated and fully automatic, it will be your new kitchen best friend. By simply pressing the top button, the electric grinder mill, will grind Himalayan salt, Kosher salt, peppercorns, black pepper, rock salt, sea salt, and regular salt. You will quickly forget your old salt and pepper shakers and replace it with this new and easy to use grinder! ONE HAND OPERATION: This salt grinder is powered by 4 AA batteries. This allows you to grind your salt or pepper with a simple press of a button. Batteries sold separately, one grinder per order. CERAMIC BLADES: The Avvio salt/pepper mill grinders have a powerful motor to grind your favorite spices. It also has hidden ceramic blades, which never rust or go dull like other steel blades. ADJUSTABLE COARSENESS: Select your desired level of coarseness. This refillable grinder is designed for all types of dry spices such as Himalayan salt, Kosher salt, peppercorns, black pepper, rock salt, sea salt, and regular salt! It is up to you how fine you would prefer the ceramic blade to grind the spice. CAP & LED LIGHT: The salt grinder has a built-in LED light to illuminate your food and allow you to see exactly how much spice you’ve added. The salt grinder comes with a cap, to prevent the salt or pepper from spilling when standing on your counter. These premium salt shakers make a great gift! LIFETIME WARRANTY: The grinder also comes with a limited lifetime warranty!